The Division 3 Champions Down face Division 2 mid table finishers Cavan in the Ulster Intermediate Championship Semi-final on Sunday June 23 in Inniskeen, Co.Monaghan writes Barry McConville. When the two counties met in 2012 it was Cavan who came out on top after extra time and went on to meet defeat in an Ulster Final against future All Ireland Champions, Armagh. Both Down and Cavan will be looking to replicate some if not all of Armagh’s achievements last year with their eyes first and foremost on a Ulster final spot 2013 against the winners of Antrim v Fermanagh. 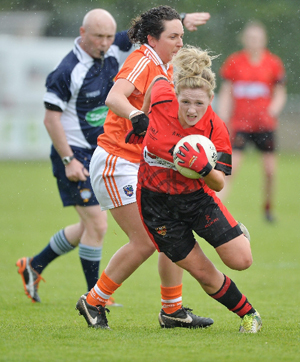 Orla Boyle in action against Armagh. Cavan’s form to date has been somewhat mediocre in the league, having lost 4, and drawn 1 in the Tesco HomeGrown Div 2. Cavan have failed to impress thus far. However as a barometer, league form is notoriously an unreliable indicator, but compared to Down’s form in the league Cavan’s can only be described as uneventful. Down on the other hand have earned the tag of Comeback Queens in 2013. Their never give an inch style of play from a spectators perspective is a joy to watch. Fast flowing, end to end play by a team that will never give up, Down will surely serve up more of the same against Cavan . Armagh and Longford can both testify to the resilience of Down, both thought they had done enough to put these young pretenders out of sight and both fell on their swords. Cavan will no doubt have done their homework and will be fully aware of Down’s potential to cause an upset. When we spoke to Down Ladies Manager Benji Ward this week about their chances against a strongly fancied Cavan side in the upcoming Ulster Semi-Final in Inniskeen on Sunday 23rd June, Benji was keen to point to Cavan’s strengths and he was most certainly not under-estimating Cavan. Benji said: “We’re looking forward to playing Cavan, they were a division above this year and we are under no illusions as to their capabilities. They beat us last year after extra time in the Ulster Semi-Final, and with quality players such as Bronagh Sheridan and Aisling Doonan in attack we need to be prepared defensively. “Cavan have also have Roisin O Keefe and Claragh O’Reilly both these girls played pivotal roles for Ulster when they beat Connaught in the provincial final a couple of weeks ago and Rosie Crowe too in Mid-field will be a threat to us. Defensively for Cavan I feel Sinead Greene and Donna English have been playing some fine football this year, and I don’t mind saying when you take all that into account we are going in as the underdogs but its probably how we prefer it, going by the season so far. 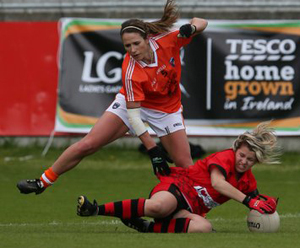 Tash Ferris in posssession for Down against Armagh in a previous clash. “This Down squad have worked extremely hard since the early autumn last year . 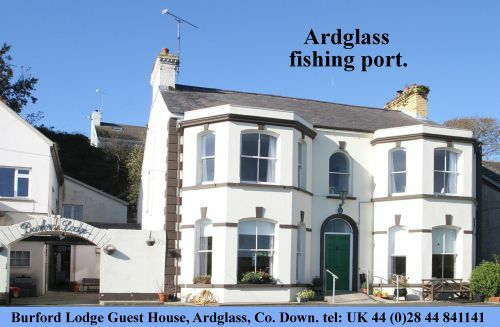 We’ve had 75 sessions to date, we’ve been running up down the Mournes, we’ve been training on the golden sands in Murlough Bay and we’ve availed of club pitches in Down from Banbridge to Clonduff, during the long cold winter. But even on the darkest coldest nights, the Down girls turned out in numbers, fighting for their place on the squad. Yes, we won Division 3 this year, and that was our primary goal, to be playing Div 2 football in 2014. But that’s over and forgot about now and we’re now fully focused on the Ulster Championship, and our meet with a Cavan side who just two years ago were unlucky to lose an All-Ireland Final against Westmeath in a replay. It’s going to be tough but we’d expect it no other way from Cavan. “But I’d like to take this opportunity on behalf of the girls and the backroom team to thank the Down supporters for their support this year to date, it’s been fantastic, but what the girls would really like to see is the County out supporting us on the 23rd too. We know it’ll be a big ask with the men taking on Donegal the same day in Breffini park, but the throw-in for us is not until 5.30pm and sure it’s on your way home anyway!” said Benji Ward. Down take on Cavan in the Ulster Intermediate Championship Semi-Final at Inniskeen, Co.Monaghan Sunday 23rd June throw-in 5.30pm. This is followed by the Ulster Senior Championship Semi-Final Armagh v Tyrone.